Iconic Italian rock singer Vasco Rossi played seven sold-out stadium shows, making a breath-taking live ‘come-back’ to mark the latest episode of his colourful 35 year career. A stunning lighting design was by Giovanni Pinna which included a unique back wall feature, created using 76 Robe ROBIN 100 LEDBeams. Pinna – who has lit Rossi’s shows since 1993 – also seized the opportunity to debut live the first Robe’s new ROBIN Pointe fixtures in Italy. 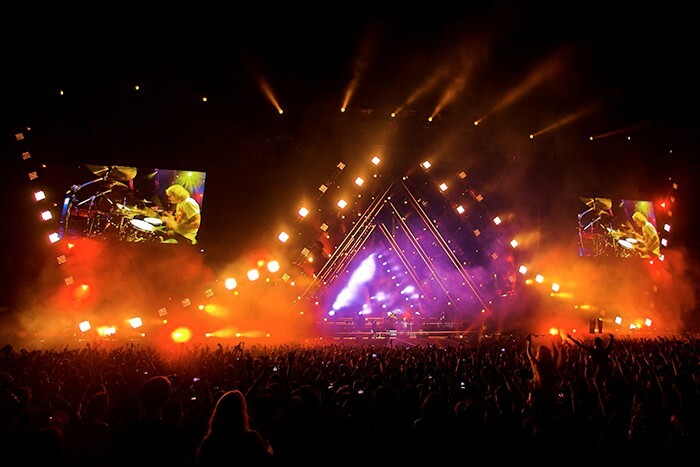 The triangular shaped upstage LEDBeam 100 matrix was revealed eight songs into the set and used for around 80% of the lighting ‘specials’ thereafter. For maximum impact, Pinna applied the effects sparingly and very precisely during the superstar’s epic two-and-a-half hour performance. Each time he did, the matrix looked refreshingly different. Another 20 LEDBeam 100s were positioned along the front lip of the stage, used for low level band lighting, for skimming out the audience and also highlighting the imposing trussing architecture up above. The Pointes were also placed in this same area and used to multi-task including providing additional lighting and effects on the band. Pinna’s dual starting points for the lighting design on these shows was the end of the last tour in 2011 – which was abrupt and un-planned – combined with Vasco’s classic logo, on which Gioforma of Milan also modelled their stage set . "I had to ensure that the visuals had maximum impact, contain a thread from the previous tour and also fitted the budget," he explained. He set the scene with a series of very tall trusses configured into triangles towering above the performance bringing industrial elegance to the stage. These were joined to further off-stage diagonal trusses zig-zagging across the PA wings. The trusses also closed down the stage space which became very intimate in spite of the fact that these were stadium shows. He hit on the triangular shaped LEDBeam matrix idea as something that would contrast and complement the Vasco logo, and that could be used for a number of tasks including adding accents and punctuations like bumping and strobing to the music. The LEDBeam 100s were mounted on a custom frame made by Rome based lighting rental contractor Limelight, and covered an area approximately 14.5 metres at the base and 12 metres high, offset from each other by 90 and 60 centimetres. Usually receiving a massive roar from the crowd the first time it’s used, the trick that Pinna weaved so well into the whole presentation … was simply not to over-do it! He likes everything about the little LEDBeam 100 fixtures, "Fast, powerful, colourful – simply a great fixture," he enthused with a characteristic smile! The speed at which the LEDBeams move and bump on and off enabled him to produce some wild effects especially when used in conjunction with the 56 Jarags that were placed all over the zigzagging trusses. "There is no way that a discharge lightsource could work for these type of speed effects," he commented. "The LEDBeam is just hugely versatile, and in fact they really make this show," he summed up. The Pointes arrived in the country just in time for the first concert, so Pinna had limited time to properly experiment with them, but he really liked what he’s seen so far. "They have an incredible zoom," he said, adding that they are also very fast moving and with the frost filters applied, he used them extensively for dramatic and powerful front lighting of the band. Both the LEDBeam 100s and the Pointes have been 100% reliable, performing perfectly throughout Rosco Vassi’s intense three-week rehearsal and show schedule. Pinna operated the lighting - around 500 fixtures including the Robes, other moving lights, Jarags, blinders and strobes - using a grandMA console, which was also controlling 300 metres of MiStrip LEDs profiling the onstage trusses. His crew chief from Limelight for the shows was Fabrizio Moggio. 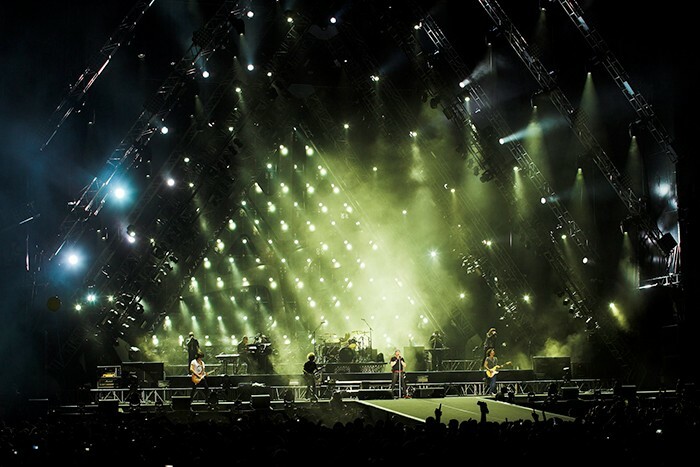 Vasco Rossi and Pinna’s spectacular lightshow delighted capacity crowds in Turin and Bologna, proving beyond any doubt that the artist - among Italy’s most successful entertainers - is very much back on top form. His 27th album is planned for 2014.